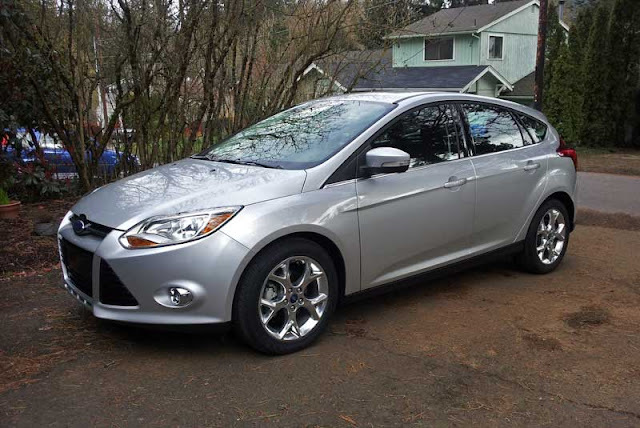 In the driveway this week is the 2012 Ford Focus SEL. I put about 40 miles on it today, mostly on the highway. I was easily able to get about 31 MPG, which is great. The car is rated 27 city and 37 highway MPG, by the way. The inside is very styled and has a futuristic feel. And this is another vehicle with a lot of tech goods, including Ford's SYNC system and a great stereo. I really like the look of the latest Focus. It's modern, somewhat European, and it feels very solid on the road.The ride feels impressive on the highway, although cornering feels a bit soft. The 2.0-liter engine is equipped with the PowerShift 6-speed dual-clutch trans. Power seems adequate thus far, but not neck snapping. I'm looking forward to getting Mercedes' impression of the vehicle, as she'll be driving it the next couple of days. Stay tuned! I recently took one of these on a 1000 mile round trip, road trip. I loved Sync, I loved the handling/suspension. I loved pretty much everything about the car. 40MPG is not possibly on the interestate though, on rural highways 55-60mph yes, but 32-34MPG is what to expect interstate-wise. My only major gripe with the car is the gearbox, it's terrible, what's worse is the manual transmission option is only a five-speed, not a six like the auto. Tony, do you mean the automatic gearbox was terrible?, or did you have a stick? The reason i ask, is i ordered a 5speed Focus SEL, should be getting it in a few weeks, but i cant find many comments on how the manual transmission feels and runs. If it was a manual you had, id love to hear your thoughts on the 1000 mile trek you took it on, i plan to do a number of roadtrips with it. I own a 2012 manual SE sport. And Its an awesome well sorted transmission. Sporty yet in harmony with its economy car roots, while feeling a little underated, and strong through most of the rev range. When pushed it handles really well, a near match to the Mazda 3 with a slight lean towards comfort. Maybe a sway bar or coil away from perfect. It probably should have a 6speed, but you won't miss it much in everyday drive since the spacing is pretty good and the MTX-75 is reliable. And it almost never loses its composure, and the clutch is very communicative and clear. Also the mpg sweet spot is 55~65mph. I don't drive more than ten over anyway and get 36~38 on longer hwy trips. 32~34 on shorter or going 70+.